Every web page resides inside a browser window which can be considered as an object. A Document object represents the HTML document that is displayed in that window. The Document object has various properties that refer to other objects which allow access to and modification of document content. The way a document content is accessed and modified is called the Document Object Model, or DOM. The Objects are organized in a hierarchy. 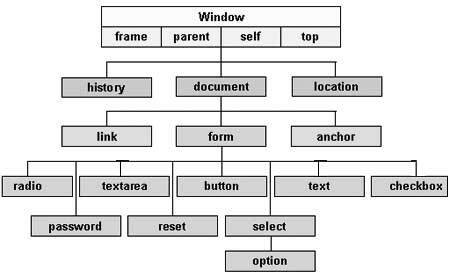 This hierarchical structure applies to the organization of objects in a Web document. Window object − Top of the hierarchy. It is the outmost element of the object hierarchy. Document object − Each HTML document that gets loaded into a window becomes a document object. The document contains the contents of the page. Form object − Everything enclosed in the <form>...</form> tags sets the form object. Form control elements − The form object contains all the elements defined for that object such as text fields, buttons, radio buttons, and checkboxes. There are several DOMs in existence. The following sections explain each of these DOMs in detail and describe how you can use them to access and modify document content. The W3C DOM − This document object model allows access and modification of all document content and is standardized by the World Wide Web Consortium (W3C). This model is supported by almost all the modern browsers. The IE4 DOM − This document object model was introduced in Version 4 of Microsoft's Internet Explorer browser. IE 5 and later versions include support for most basic W3C DOM features.